Ship Notes: IN STOCK! Fast Free Shipping. Quick Kleen, Bagless Dust Cup System, Commercial Upright Vacuum Cleaner. The Preferred choice of Supermarkets and Buildings Cleaning Crew contractors. Superior Cleaning. This vacuum provide immediate cost savings by eliminating the need to purchase bags. The best and original commercial Bagless Vacuum. The innovative Sanitaire commercial bagless SC887 is UL listed and designed with the exclusive Quick Kleen feature that allows for easy access to the fan chamber. The 12-inch cleaning width, six level carpet adjustments and 50-foot power cord combined with the Vibra Groomer II chrome steel brush roll, large easy-roll wheels and chrome steel hood help to extend the life of these machines, plus save time and money. the SC887 has the EZ-Kleen® clear dust cup that allows the operator to see when the dust cup needs to be emptied. This Sanitaire model is the choice of extraordinary cleaning performance and long life. On Sale $269.00 with Fast Free Shipping the innovative Sanitaire commercial bagless SC887 Sanitaire is UL listed for commercial use and designed with the exclusive Quick Kleen feature that allows for easy access to the fan chamber. The 12-inch cleaning width, six level carpet adjustments and 50-foot power cord combined with the Vibra Groomer II chrome steel brush roll, large easy-roll wheels and chrome steel hood help to extend the life of these machines, plus save time and money. 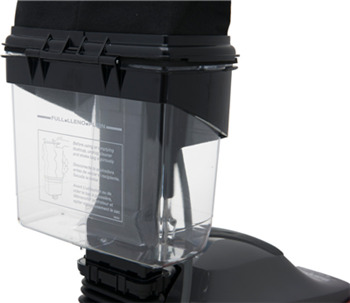 the Sanitaire SC887 has the EZ-Kleen® clear dust cup that allows the operator to see when the dust cup needs to be emptied. This Sanitaire model is the choice of extraordinary cleaning performance and long life. Commercial-grade performance from a seven amp, 840 watt motor rated at producing 145 CFM. Quick-release latch system for removing and emptying the dirt cup. Tool-free brushroll and belt replacement. A 50- foot cord allows for less downtime and quick, efficient cleaning. Bagless Style. Our dust cup uprights are the perfect solution for those who don't want to manage or pay for disposable bags. These uprights provide immediate cost savings by eliminating the need to purchase bags. That means your staff can focus on cleaning and reduce time and money spent on maintenance. Our Bagless models offer the same great cleaning system, and combine an outer bag with an easy-to empty clear dust cup. Simply release two latches, pivot the upper back and pull out the dust cup to empty. Reverse the process, and you are back to cleaning in minutes. Sanitaire model SC887B is designed and built with highly-efficient, extra long-lasting commercial motor for less maintenance and down time. Have the vibrating action of the chrome steel ball bearing brushroll, Vibra Groomer II®. Commercial cleaning has never been easier with six carpet level adjustments, a 12-inch cleaning width and 50-foot power cord. Save time and money with these long-lasting uprights that have a chrome hood cover. With rugged construction and extra features, Sanitaire is the choice for exceptional cleaning performance. Dust Cup Uprights come with the Easy Release Dust Cup. Simply release the latches, pivot the upper bag back, and pull out the dust cup to empty. 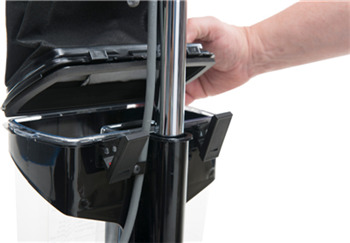 high filtration dust cup upright means no keeping track of or paying for disposable bags. Re-engineered motor includes integrated bearings and an enclosed carbon brush system. Motor Life is more than double our previous long-life version. The clear-cover fan chamber lets you view, service or access the impeller fan without removing the motor, reducing maintenance time. Vibra Groomer II, double ball bearing chrome steel with replaceable bristle strips.